« Cardinal Track Ready To Run! 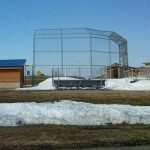 Monday’s slightly warmer temperatures, and sunshine is helping to melt Mother Nature’s mess from late last week, however, many games throughout the week have been postponed, with all games and meets not happening on Monday in Hastings and Prescott. KDWA’s Nick Tuckner has more on all of the schedule changes so far, this week!